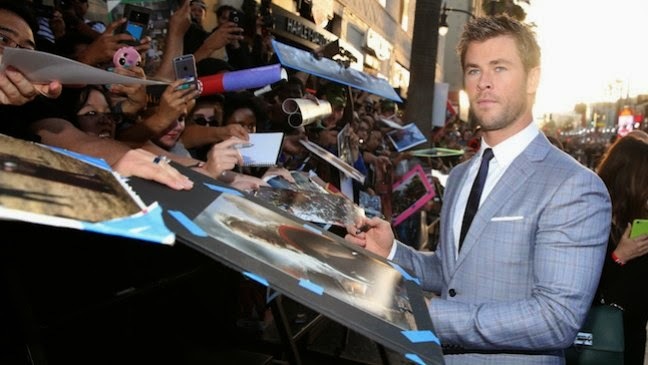 Robert Downey Jr., Chris Hemsworth, Chris Evans, Scarlett Johansson and Mark Ruffalo were among the stars walking the red carpet at the Dolby Theatre on Monday. It was a lively reunion when the stars of The Avengers assembled in Los Angeles for the world premiere of the movie's action-packed sequel, Age of Ultron, on Monday night. Stars of the Marvel and Disney film — including Robert Downey Jr., Chris Hemsworth, Chris Evans, Scarlett Johansson and Mark Ruffalo — joined director Joss Whedon on the red carpet at the Dolby Theatre before heading inside for the star-studded event. The actors were joined by hundreds of screaming fans who lined Hollywood Boulevard and weaved up the red carpet all the way to the theater doors. "Without the built-in fan base, these movies wouldn't happen," Evans told THR on the red carpet. "It's exciting to be a part of something that you know fans are going to see, that they're excited about. It's intimidating, but the truth is, Marvel has yet to let me down." Ruffalo, who reprised his role as the Hulk, says his motion-capture work as the green superhero is the toughest on him — and his body. "Every time I had to do the Hulk stuff, something would get pulled or sprained," he said.